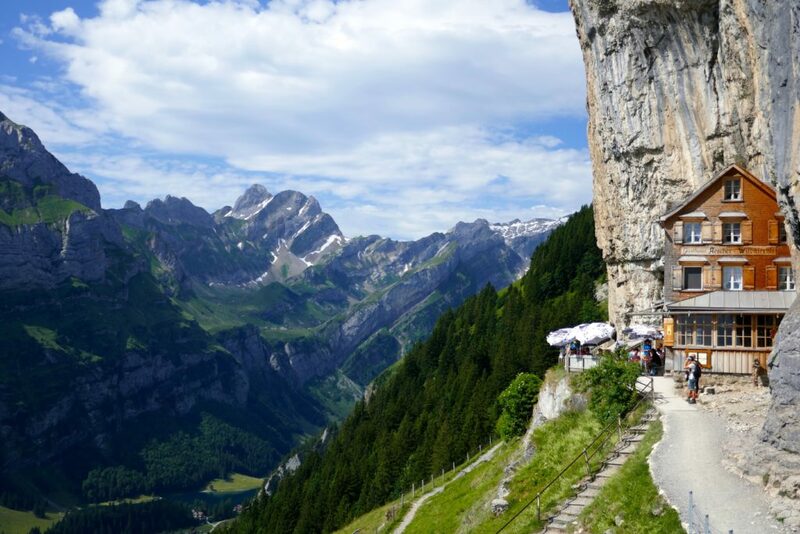 This hiking tour takes you to the traditional Alpstein/Appenzell area in the northeast corner of Switzerland. 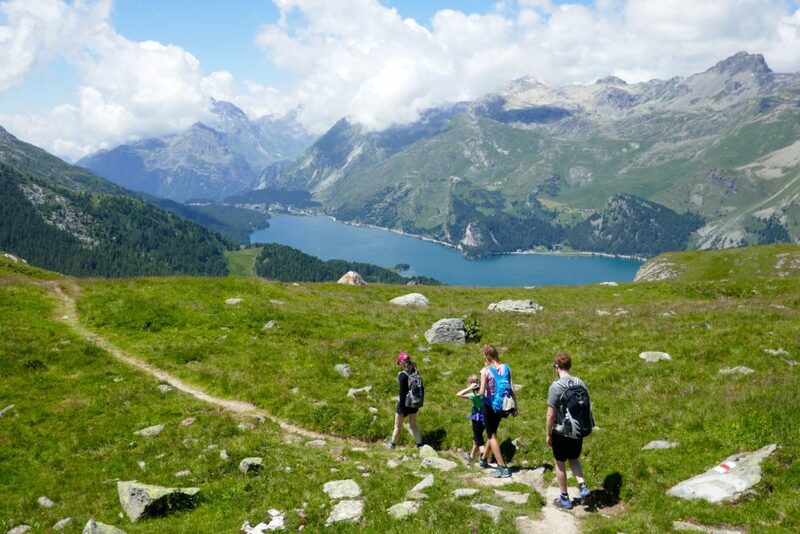 Later we travel by UNESCO Bernina Express train to the world famous Engadin/St.Moritz valley where we spend a view hiking days and sleep next to a hidden mountain lake in a beautiful, historic lake resort. 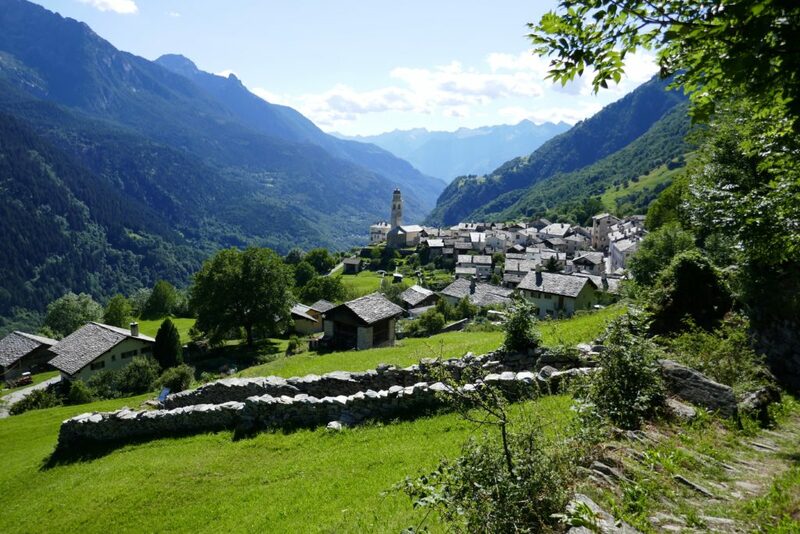 A pearl with mediterranean climate awaits for the last days; the Lake Como area in Italy and the hidden valley of Bregaglia with the protected village of Soglio. After arriving at the Airport in Zürich we take the train to Appenzell. Appenzell is a very traditional, small city near the German and Austrian border. Check-in at the Hotel, explore Appenzell’s traditional stores and taste the famous Appenzeller cheese. A short train ride brings us to Wasserauen(868m) and a cable car up to Ebenalp (1644m) where the hiking starts. We descend down to the deep blue glacial lake Seealp (1143m) lake and pass the famous mountain Inn “Äscher” and the small chapel Wild Kirchli on our way down. Maybe you want to go for a swim before ascending steeply up to Meglisalp? Our home for thonight is located on a high alpine meadow surrounded by steep limestone whalls. That’s where the cows enjoy their summer and the locals make the delicious Appenzeller cheese. We will make sure to taste some of it! If not the cowbells, than maybe the Jodel of the local farmer gathering his cows to milk them in the early morning might wake you up. We will climb up to the highest peak of the Alpstein mountians today, the Säntis. An impressive limestone mountain that offers spectacular views. We can spend all day long to reach the King of the Alpstein, spot alpine flowers and maybe a stone eagle that nests in this area. A cable car brings us down to Schwägalp and a Post bus from there down the valley and into the Toggenburg area. Here you will finally find out why the Toblerone is shaped that way. The 7 Churfirsten peaks are the real Toblerone shaped mountains. We hike along a beautiful panoramic trail that’s decorated with lots of instruments built in and with nature. A small mountain lake, the Schwendisee invites for a swim after the hike. 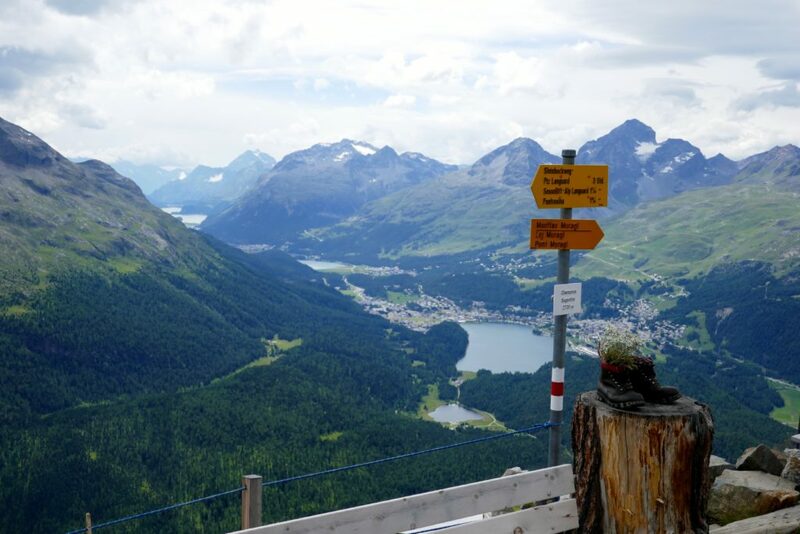 We take a post bus and the UNESCO Bernina Express train to get to the Engadin valley and St.Moritz (1800m) in the south-eastern part of Switzerland. Along the way we stop in Bergün, a pretty village with typical old Engadin style houses for lunch. 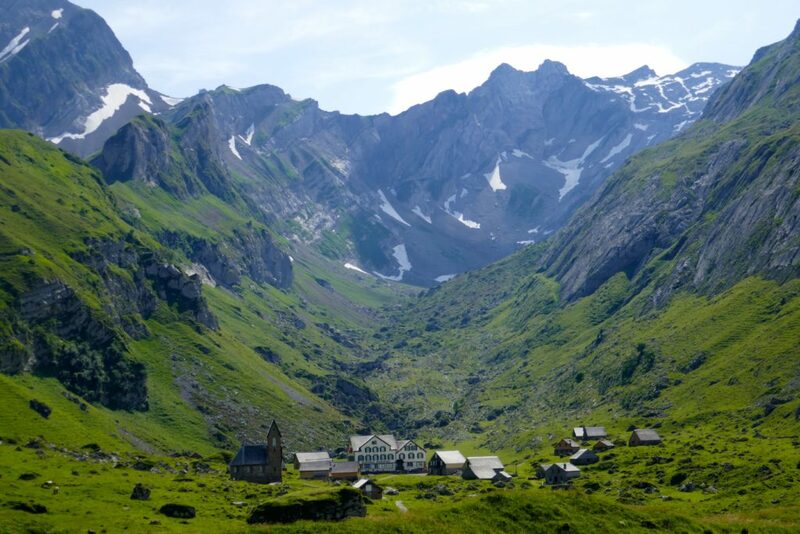 In the afternoon we hike from Bergün (1360m) to Preda (1793m) along the famous railway. This 7km long route does not only lead to a magnificent piece of nature but it also offers the opportunity to learn about some interesting railway construction techniques. Several spiral loops have been constructed in order to allow trains to gain height gradually before reaching the Albula tunnel near Preda. There are several bridges and tunnels as well. We take Graubündens second oldest funicular up to Muottas Muragl. A hike on the panoramic trail from Muottas Muragl to Alp Languard offers the best views of the valley and it’s many lakes. We might spot Steinböcke and taste the best homemade pie in southern Switzerland. Our lunch spot is at Segantini mountain hut, a real alpine refuge high above the valley. In the afternoon we can take an other short train ride on the Bernina Express and a cable car ride up to Diavolezza. There we enjoy the view over Morteratsch glacier, Piz Palü and Bernina. Europs most easterly 4000m peak. We discover the beautiful Fex valley and the deep blue lakes wher kyter and surfer enjoy the Maloja wind today. A horse wagen can bringus us back down to Sils after the hike to the end of the valley. Sils is famous for it’s many artists and writers that came here to work and get inspired surrounded by this great nature. Walking into the italian speaking area of Bregaglia valley feels like stroling trough the last century. Things are still like they used to be. We walk on a panoramic trail just opposit of the famous granit climbing walls from Piz Padile. A shuttle brings us down the valley and over the boarder into Italy. A completely diferent Flora welcomes us along the beautiful Lake Como. We explore the northern shore of the lake and take a boat to the Bellagio Island. The perfect place to celebrate the End of our hiking trip. A privat transport brings us back to Milano Malpensa airport or Como translation. This tour is luggage supported and you only walk with your day pack.